Hellenic AF, known for a long time for their eye-catching colours, for many years used three types of "forest" patterns. 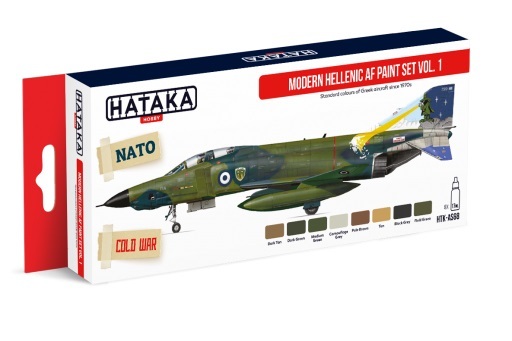 The most widespread (worn by Hellenic A-7H/E, TA-7C/H, F/RF-5A/B, F/RF-4E, F/RF-84F, F/TF-102A, F/TF/RF-104G, T-2C/E, T-33A, C-130B/H, C-47, Do-28D-2 and YS-11A) was the famous "South-East Asia, SEA" or "Vietnam" camouflage scheme. It was introduced in HAF in early 1970s and it has recently been used on some of HAF's RF-4E Phantom IIs and T-2C/E Buckeyes. Northop F-5A/B airframes purchased from Jordan in 1980s were delivered and initially flown by HAF in another US-origin pattern - so-called "Asia Minor" scheme. Finally, ex-Luftwaffe RF-4Es have been operated in Norm 83 scheme (some are still spotted). •HTK-A039 – Camouflage Grey – FS36622, widely used for lower surfaces in SEA scheme. Also on lower surfaces of ex-Jordanian F-5A/Bs in so-called "Asia Minor scheme"